Why Choose Lift Chairs 4 Less? Price - Our factory direct pricing and low price guarantee mean you get the lowest possible price on your lift chair. It also means that, with no “middle-man” involved, you receive your lift chair in days rather than weeks. Call 1-800-791-6814 now for special offers and don't forget to sign up for our e-coupons to receive special offers on lift chairs, bath lifts, and more. 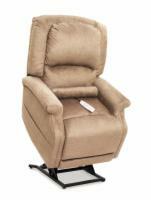 Quality - Every lift chair provided by Lift Chairs 4 Less is made from the highest grade materials both inside and out. Whether you are purchasing a Pride Lift Chair or a Golden Lift Chair, we guarantee that you will not find a better lift chair at any price. Style - With literally hundreds of lift chair fabric and color combinations available, there is no limit to the possibilities when choosing a stylish lift chair for you or your loved one. Reliability - At Lift Chairs 4 Less, we stand behind every lift chair we sell and our promise to you is to provide a quality lift chair that will provide years of dependable service. We provide the best lift chair warranties in the industry and offer extended warranties above and beyond those offered by other retailers. AmeriGlide joins our lift chair manufacturer list with several best value lift chairs. AmeriGlide offers great quality at a low price. The patented MaxiComfort positioning technology by Golden delivers the most advanced lift and recline chair available anywhere in the world! MaxiComfort system transfers you effortlessly and smoothly through multiple lift and recline positions. Pride Mobility Products Corporation is the world's largest maker of lift chairs and is a leader in new chair design and development. In addition to providing the best lift chairs for the best prices online, Lift Chairs 4 Less is also your one stop solution for home lift and mobility devices including bath lifts, clinical recliners, and walk in bathtubs. What are you waiting for? Call one of our dedicated lift chair specialists today at 1-800-791-6814 and we guarantee that we can find the right lift chair for you at a price you can afford.